Òlàjú Art Group was established in 2015 to further develop the documentation, exhibition, and preservation of African arts & culture. 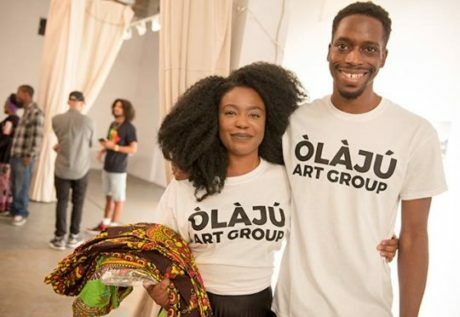 Founder and director, Obafemi Ogunleye, noticed a lack of recognition and appreciation for contemporary art coming from West Africa, specifically Nigeria, and began to formulate strategies to meet the demands. His ultimate goal has been to lead by example in finding practical solutions to sustainable arts development. ‘The Group’ is comprised of artists, curators, collectors, patrons, and members of the general public with an interest in the development of cross-cultural exchange. Our mission is to raise awareness of issues concerning West Africa and beyond through the use of visual & performing arts. By promoting emerging artists from Africa and its Diaspora, we engage international audiences with authentic culture. Through this engagement, we are able to provide signature experiences used to better understand and appreciate critical elements of our culture. The level of talents and aspirations coming from artists focused in contemporary African art is not reflected in the current international art market. We identify this emerging class of artists and support their development through residency programs, exhibitions, commissions and consultation. By linking these artists with global supporters, we hope to help realize dreams and fill a market demand. *The promotion of cultural knowledge, creativity and inter-cultural understanding through education. A critical component to our operations is cultural education. We have been considered a source of authentic connections to the West African region and beyond. Our partnerships with museums, galleries, universities and libraries offer insight to our commitment to public programming.